You want to know all about us? Gladly. We’re proud to share the Symposium story. 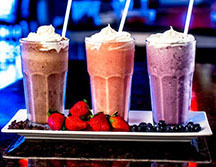 The first Symposium Cafe Restaurant opened in London, Ontario over 20 years ago and quickly became the go-to dessert place for date night and late night and a favourite local restaurant in London. But our customers wanted more. So, we kept our guest-focused full service and unique decor, but expanded the menu to include breakfast, lunch, dinner and late night meals - along with full bar service. Today, with a menu that includes burgers, steak, pasta, and seafood, we have something for everyone, and menu items for all dining periods. We’re definitely #notjustdesserts. Walk into Symposium Cafe Restaurant & Lounge and you’ll be wowed by the distinctive inviting decor and unique atmosphere. Our trademark stone-art walls and beautiful Renaissance inspired frescoes are one-of-a-kind, and with their timeless quality provide a distinctive backdrop for any restaurant dining experience; from burgers & beer to salmon & sauvignon. 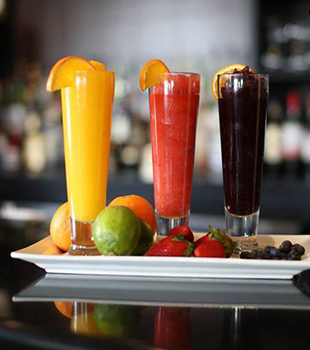 We’re what you’d call upscale casual- special enough for birthday celebrations, engagements, or business meetings, and just as fitting for quick take-out after work, dinner before a movie, or appetizers at the bar. Like traditional european cafes, all Symposium restaurants are fully licensed with a full range of wines and spirits. Our selected vintages include exclusive Owner’s Cellar wines which are not only great wines, but also great value. For beer drinkers, we offer over 10 draught beers, both domestic and imported. Symposium guests also enjoy a variety of cocktails and martinis, and when patio season opens, relax with a cold drink on our comfortable outdoor patios. We love reading customer restaurant reviews describing Symposium as their “little secret” or “unknown gem” or “favourite local restaurant”, but with over 21 restaurants, it’s obviously our guest-focused brand that makes us a favourite neighbourhood restaurant and an award winner in local communities. Guest-focused means our kitchens are open from 8am-12am (breakfast, brunch, lunch, dinner + late night dining), 364 days a year to fit your schedule. We also respond to our customer needs through our daily dining features and meal promotions. 7 days a week Symposium restaurants offer select menu items for feature prices including $5 Burgers, $48 Dinner for Two, and 33% off Appetizers. Our 7 Day restaurant Specials were the first of their kind and continue to be customer favourites. Check out all our offerings on the Our Menu page of our website. Giving back to the neighbourhood has always been important to us, and the Symposium Charity division supports local Breakfast Club Canada programs in Symposium communities.These programs work due to the efforts of generous volunteers and $percentages from our 7 Day Specials help fund local schools. 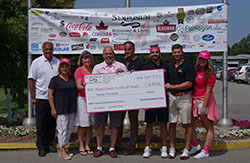 In addition we support Breast Cancer Research - through our Annual Golf Tournament - World Vision and Canadian athletes. So that’s what we’re about. We’re glad you’ve gotten to know us and we look forward to your next visit. Whether it’s sharing appetizers with friends, family dining, special occasions, or business lunches; we’ve got something for you - 7 days a week - from early mornings to late nights. We’re proud to be your “go-to” local restaurant for quality, casual dining, and invite you to experience the warmth and hospitality of our Symposium style.